I have been meaning on writing this post for quite some time now. With a new year, comes a fresh determination to spend more time posting to my blog. In June of 2011, I was fortunate enough to spend a week in Italy. I was accompanying my husband on a business trip in Milan and Rome. We did not have much advance notice of this trip, but we did our best to make the most of our time while there. 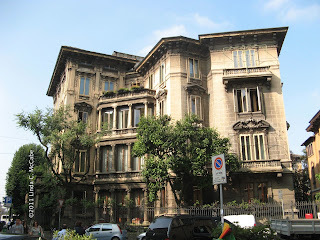 On a Tuesday morning, while my husband was giving his business lecture, I was free to explore Milan by myself. 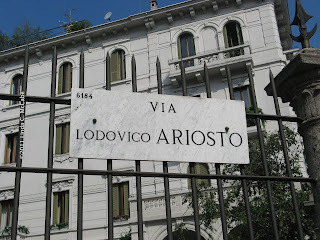 I was on a mission to find anything that had to do with Ludovico Ariosto and his epic poem Orlando furioso. 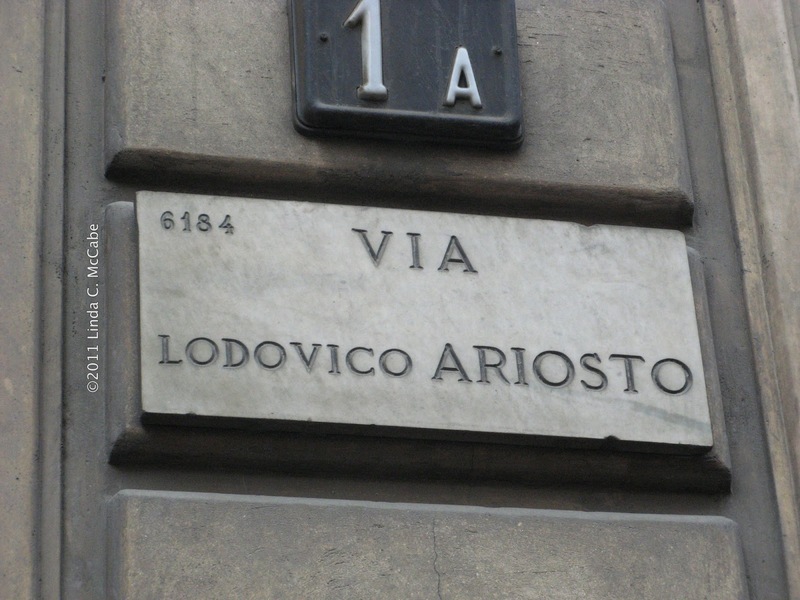 I was happy to discover there was a street named Via Ariosto. While looking on the Streetwise Map of Milan, I saw a listing on that street of a store named The English Bookshop. 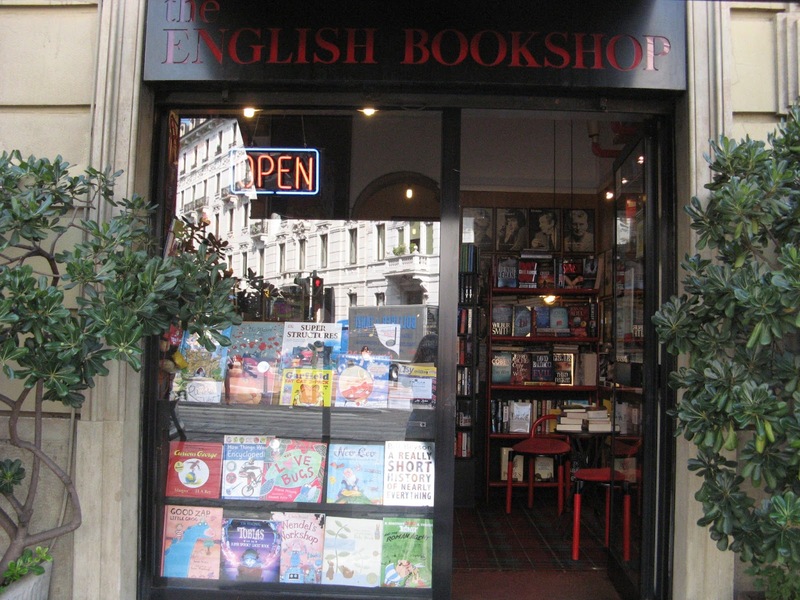 Going on the internet, I found a website dedicated to English language bookstores in Europe called the Bookstore Guide and their listing for that store. 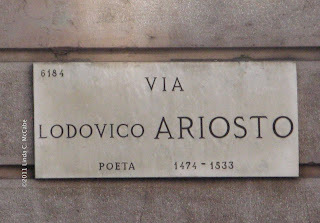 It was scheduled to open at 9:30 am, so I made my way to Via Ariosto with the intent of not only taking pictures of anything with Ariosto's name on it, but exploring the bookstore. I was pleased to find several different styles of road markers. This is my favorite of the markers. 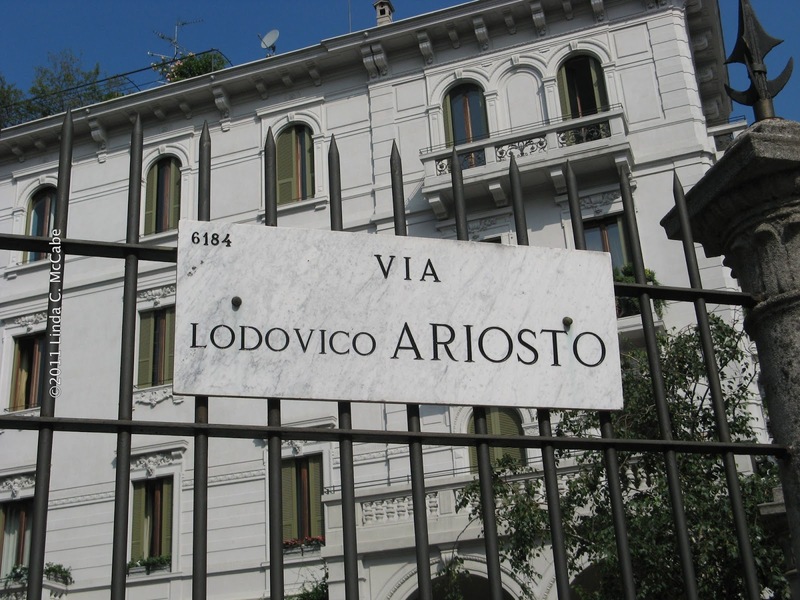 Via Arisoto is a beautiful street with houses such as this lining it. Imagine living in such a mansion in Italy. I arrived at the bookstore shortly after it opened and introduced myself to the owner, a British gentleman by the name of Peter Panton. 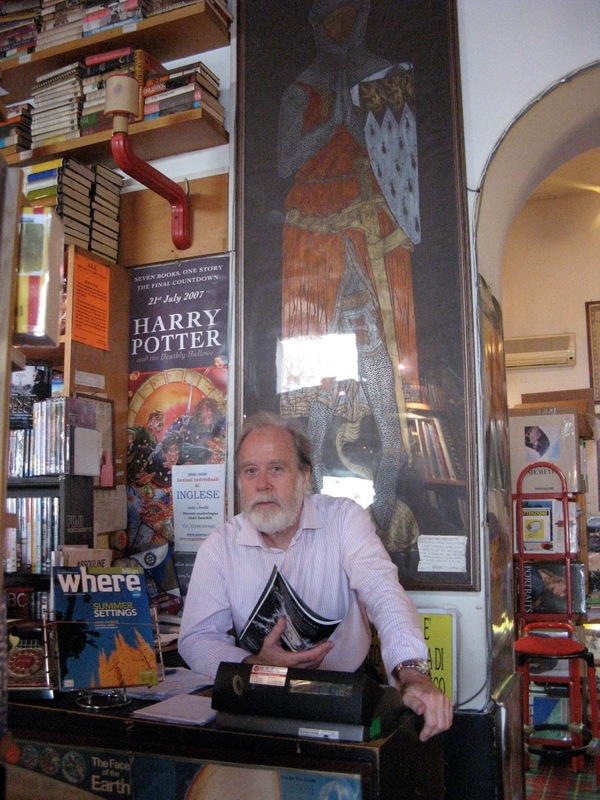 I had a lovely chat with him about writing, bookstores, and what it is like living in Italy. 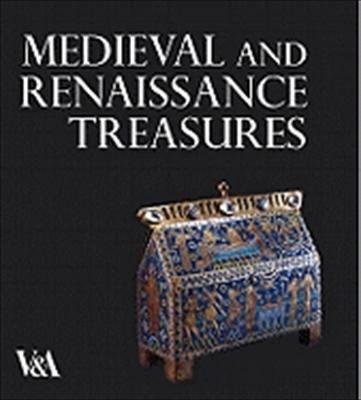 As I suspected, he had read Orlando furioso. I would have thought it almost a requirement for a bookstore owner on a street named for a famous poet to read the poet's work. Several customers came in during the time I was there and I watched him converse with them in fluent Italian. His having lived in Italy for several decades, being fluent in their language would also be a necessity. Ah yes, the European custom of closing a business during lunchtime and on Sundays. That is not something that happens often in the United States, but perhaps we ought to do it more often. It is a civilizing influence. 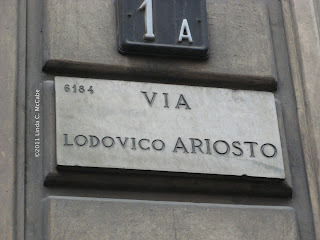 The address for the bookshop is actually 12 Via L. Mascheroni, but the store's front door is on Via Ariosto. I will concur that the store has an English flair to it. I was drawn to the prominent image on the wall of a knight in repose. I tried taking several snapshots of it, this was the one with the least glare and the most color. An etching made from atop a gravestone. 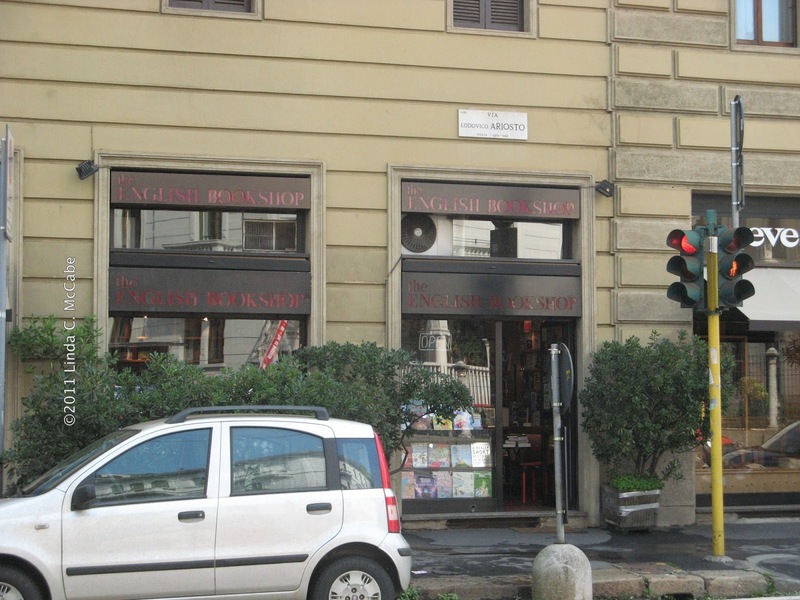 Here is another picture of the bookstore from the outside and if you look closely you can see the street marker of Via Ariosto above the store's signage. 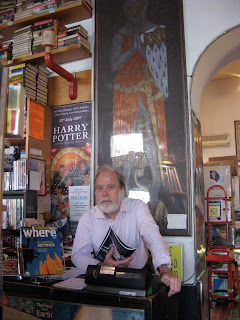 There is even a video showing the inside of Panton's English Bookshop and highlighting his dog. I don't recall seeing the pooch in the store, but perhaps I was just so captivated with our discussion about writing and books, that I forgot about his furry companion. In the video, the dog appears to be as friendly as his owner. I tried uploading this video before using Blogger and it didn't work well. Here is a link, just in case. I even purchased a copy of the book Medieval and Renaissance Treasures from the Victoria and Albert Museum. It is hard for me to walk out of a bookstore with only one book, but I try to follow the edict of traveling light and a suitcase full of books can get quite heavy. 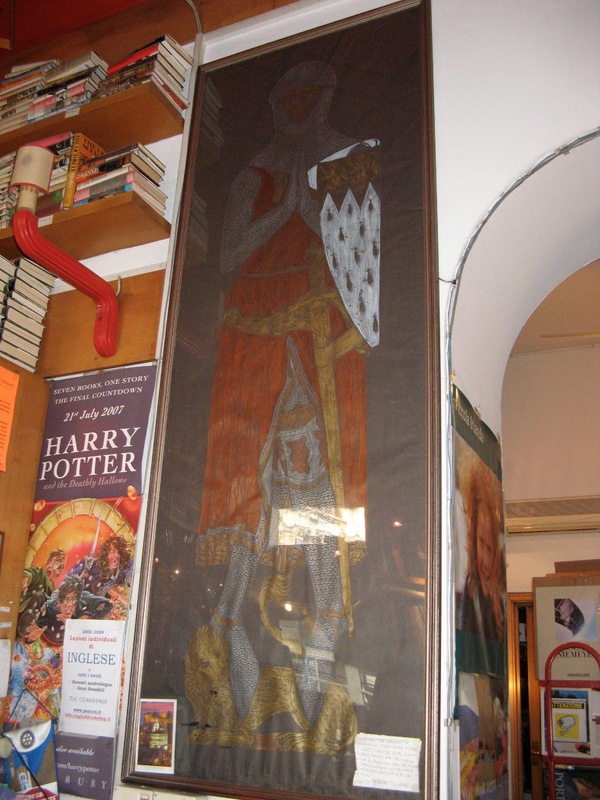 I hope that anyone who visits Milan takes the time to stop by Peter Panton's charming bookstore. Note: there is another bookstore with a similar name and there might be some confusion. 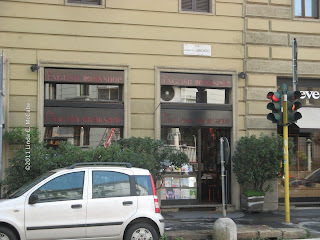 The other one is the American Bookstore and it is across from the Sforza Castle. I visited there as well, but I found the selection was generally travel guides and mass market paperbacks that you could find in any airport. There was not the same sense of community and belonging. A large part of that is because one is in the heart of the tourist traffic and the other is in a neighborhood. I much prefer places with character.